This sweet little number is made from repurposed fabric! Believe it or not this dress used to be a shower curtain (100% cotton of course)! I came across it while shopping w/ my mom and I knew that it would make the most gorgeous sundress! I absolutely LOVE it! The beautiful floral print just screams Hawaii...hence the name. 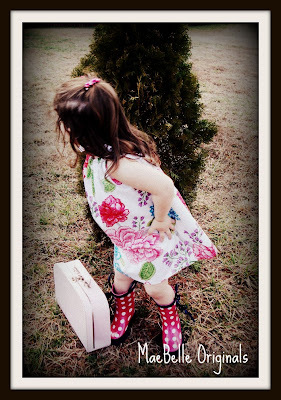 This would make for some gorgeous spring and summer portraits at the beach or any other warm weather locale! 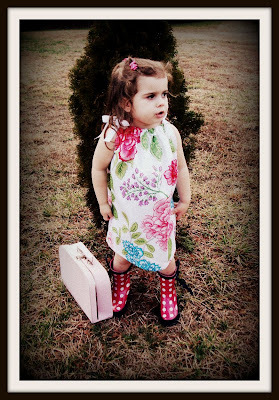 Your little sweetie will look stunning! Add a sweet little flower embellishment to her hair and she's ready to go! PS. For all of you wondering....yes, the shower curtain was brand new, never used! I'm not THAT crazy! Have a great weekend! So bright and happy! Great for Easter! That is a great dress! It would be perfect for an Easter egg hunt! I actually own this shower curtain and every time I walk by it I can't help but think what a gorgeous dress it would make... turns out I was right!